Global markets continue to follow the release of the financial statements of the giants of our planet. And today the company Microsoft is expected to announce FY reporting, and according to forecasts, it will surpass the expectations of experts. According to the company promises to invest annually in cyber security more than $ 1 billion company seriously protects its customers. Dow Jones continues strong growth on the background of the new president of Trump's statements and positions already broken 20,000 points. Previous NASDAQ closing on Microsoft shares were at 63.52, and already pre-market price starts at 64! Technical Summary of the company's share shows a steady increase in their prices, for all the expectations of the US market opens today another increase. The company's shares are again in front of his next historical maximum. This is a good sign for investors who prefer a breakout trading strategy on the stock market. 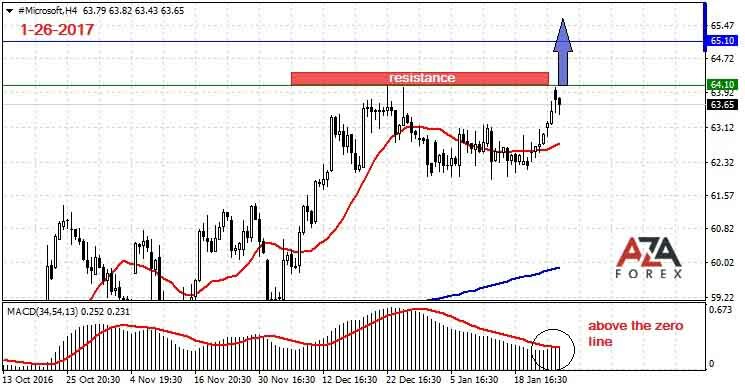 If you look at the graph of shares it is clear that, as a rule, the stock makes a new high, then traded in a range, and as soon as the break through the resistance level, the price jumps to 200 points. In this case, the share price has already clinging to the historic maximum and ready to overcome it. We target in 100 points upper, which is the minimum price change, which follows the new take-off. So, we wait and watch the opening of trading in the stock markets, and if the price goes according to our scenario, we open a long position.